F.D. Lake Field & In-House Services. 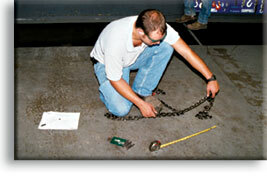 Chain Sling Inspections, Repairs, Chain Safety Classes. Customers within our field service area of Upper & Lower Michigan & Northern Indiana have come to rely on the expert advice of our trained, experienced Field Service Representatives. If you're located within in our service area, a visit from a field rep is only a phone call away. Our field representatives are available to visit your facility or job site to help you find safe, cost effective solutions to your immediate or long range rigging or material handling problems. For especially difficult situations, we can call in an expert from one of our national suppliers to help provide the answers you need. We also offer a 2 Hour rigging class that covers new industry expectations, definitions, identification requirements on slings and hardware, chain grade identification, how to plan every lift, the rigging triangle, as well as the inspection and rejection criteria for your slings and hardware. For a more detailed description of the class you can click here. 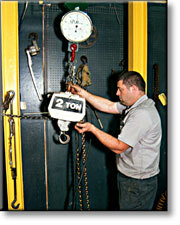 OSHA and ASME B30.9 regulations require a complete inspection and recording of all chain slings at least once a year by a qualified person. An annual inspection can be scheduled with your field representative. Call customer service to schedule an inspection. Within our delivery area, oversized or time sensitive orders can be delivered to your facility or job site by one of our drivers. Contact our customer service department for details. Product Safety Seminars can be arranged for you and your employees at your facility, our facility or other convenient location. Seminars can be scheduled through your field representative or customer service. These free one day classes cover chain grade identification, sling chain theory, angular lifting, inspection, OSHA standards and much more. For availability, call our toll free number below. For more information on the classes, call or click here. At our Grand Rapids facility we fabricate and proof test wire rope slings, chain slings, synthetic web slings, wire rope and fiber rope assemblies. Chain mesh and metal mesh slings will be shipped to the manufacturer for repair. Our Customer Service Representatives are well qualified to help you solve rigging or material handling problems that don't require on-site observation. You can rely on their experience and knowledge to help you select the best product for your application, or to provide insightful technical advice after sale. They are your connection to the engineers who design and continually improve the products you're using in the field. Videos on a variety of topics, relating to rigging, material handling, and fall protection can be borrowed from our library of suppliers' videos by our registered Rigging Store members. Ask your field rep or call customer service for a list of titles and ordering information.